If Sound Transit 3 passes, taxes will continue for at least a few years after 62 more miles of light rail are done in 2041. A win for this year’s follow-up, Proposition 1, also known as Sound Transit 3, would give those grandchildren their own opportunity to pay the favor forward. The proposed ST3 property tax, car-tab and sales-tax increases would last at least three decades to fund construction, debt and operating costs. 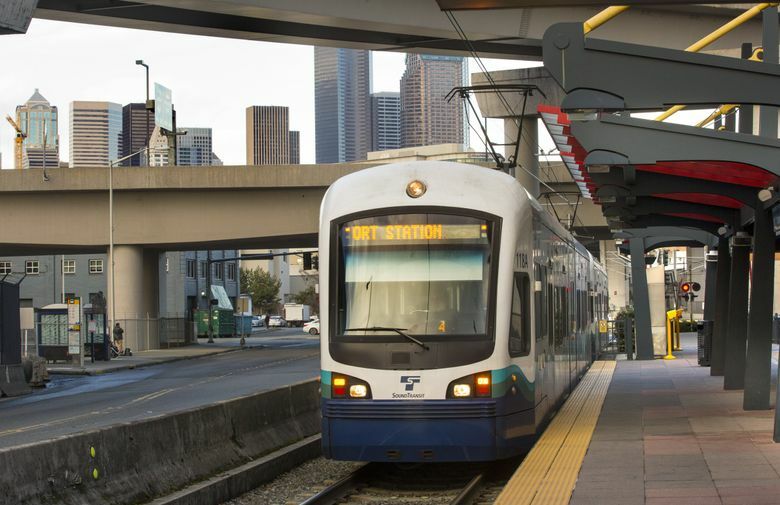 This fall’s $54 billion measure, featuring light-rail segments to Everett, South Kirkland, Issaquah, Tacoma, West Seattle and Ballard, would require a third wave of taxes, plus the two that voters previously approved. • Sales tax of 0.5 percent. • Car-tab tax of $30 yearly per $10,000 vehicle value. • Car-rental sales tax of 0.8 percent. • Sales tax increased to 0.9 percent. • Sales-tax increase to 1.4 percent, or $1.40 per $100 purchase. • Car-tab tax increase to $110 per $10,000 vehicle value. • New property tax of $25 per $100,000 home value, also paid by commercial property owners. • King County Metro Transit, 0.9 percent sales tax countywide, and a property tax currently $6.30 per $100,000 of value. • City of Seattle, $60 car-tab fee and 0.1 percent sales tax, to buy more King County Metro bus-service hours. • Community Transit, 1.2 percent sales tax in Snohomish County, except Everett. • Everett Transit, 0.6 percent sales tax. • Pierce Transit, 0.6 percent sales tax in Tacoma and close-in suburbs. • King County Water Taxi, property tax of 29 cents per $100,000 of value. The $54 billion plan promises 62 more miles of light rail, Sounder trains as far south as DuPont, more park-and-ride spaces, and bus-rapid transit for Highway 522 and Interstate 405, at a cost of $326 next year per median household. The measure also would extend the transit taxes voters approved in 1996 and 2008, which would otherwise be reduced years sooner. A vote to approve ST3 would roughly double your taxes for Sound Transit, which covers urban areas in Snohomish, King and Pierce counties. Existing Sound Transit taxes continue regardless of the ST3 vote. To skeptics, using property taxes for Sound Transit would make it politically harder for the Legislatureto boost taxes for statewide education. On the other hand, ST3 would send Olympia a total $518 million in payments. That money was demanded by the Legislature, as a condition of letting Sound Transit seek tax increases. Supporters tout the value of time people could save if ST3 helps them avoid 148 hours per year of traffic delay in the Seattle area, or that they can save thousands of dollars by ditching a car. And lawmakers still have room to maneuver on taxes, they say. Voters will get their ballots in the mail within about three weeks. Sound Transit’s official estimate for ST3 is $326 in taxes per median household next year. The agency likes to describe it as $169 per adult, or $14 a month. Individual costs would vary. To find yours, try our calculator at seattletimes.com. That median household, at $77,000 income, already pays $303 a year for earlier phases of Sound Transit, approved by voters. With ST3 added, the total would be $629. ST3 costs would run higher in relatively affluent Seattle and the Eastside, since the medians are lowered by cheaper Pierce County, where home values lag more than $100,000, or $25 in ST3 tax. Owners of fancier cars may also be surprised by high bills, since most people own older cars; the median car value of $5,333 cited by Sound Transit represents far less than the average $10,000, a $40 difference in ST3 tax. The total car-tab tax (for Sound Transit 1 and 3) of $110 per $10,000 would decline after 2028, by $30 per $10,000 vehicle value, a quirk related to bond contracts. Voters in 2002 passed Tim Eyman’s Initiative 776, to push car-tab rates down to a flat $30, but the transit agency had already sold 30-year bonds in 1999. The state Supreme Court agreed with Sound Transit’s argument that bond contracts establish the power to keep the car tax in effect, until bonds expire. Property taxes under ST3 would increase no more than an average 1 percent a year after 2017, due to state caps — even if the housing market continues to boil. How long would the taxes last? ST3 taxes would stretch past the agency’s 2041 goal to finish the new rail, bus and park-and-ride projects, to finish repaying a proposed $11 billion in bonds. Bond sales would generate money for construction sooner than a pay-as-you-go system. To build projects faster, the taxes (or federal aid, discussed below) would have to be higher. The last scheduled ST3 bond payment is 2068, or 30 years after the last bonds would be sold, the finance plan shows. But long before that, the agency can accumulate surpluses, which Chief Financial Officer Brian McCartan’s model show totaling $50 billion in 2060. What if transit directors decided to pay off their credit card ASAP? An early bond payoff, known as defeasement, can be accomplished in the 2040s, based on a new analysis, said spokesman Geoff Patrick. In that case, financial models say, all the ST3 taxes could be repealed in 2048, along with 11 percent of the sales taxes from ST1 and 2, according to Patrick. Doing so would require a stable economy, projects finished on time and on budget, and no shocking rise in operating costs. Opponents claim the taxes are “permanent,” but the word “indefinite” better describes the situation. The full text of Sound Transit’s ballot resolution requires such a rollback to the levels needed for operations, but leaves final discretion to the future transit board. But a rollback isn’t really what transit supporters have in mind. Many are looking forward to Sound Transit 4. To prepare for that, ST3 includes study money for ST4 lines in the Ballard-U District-Highway 520 corridor and to North Everett, Burien, Renton, Tacoma Mall and Orting. A ST4 proposition, in some presidential-election year when young people vote, would likely include continuing the stream from ST 1-2-3 taxes. So there’s no big tax cut, unless voters or state lawmakers consistently reject Sound Transit expansion plans until midcentury — while population grows by the size of metro Portland. Is there a sunset clause? The Supreme Court has given Sound Transit legal authority to take as many years as needed, without a cost ceiling, to build projects in the voter-approved plans. Or the board may cut or delay projects. That ruling allowed the agency to survive, despite costs that spiked 86 percent higher than the 1996 ballot figures, forcing a decade of project delays. The good news is that current projects are trending close to estimated costs. The University of Washington, Capitol Hill and Angle Lake stations opened this year under their post-2001 budgets, with a combined $240 million in contingency funds unspent. Agency leaders say the age of overruns is over, though Rogoff warns a second downtown Seattle tunnel, included in ST3, would be difficult because it goes under existing train tubes at Westlake Station. Opponent Kevin Wallace, a Bellevue council member, doesn’t dwell on overruns. He takes the opposite tack, that ST3 budgets, which show contingency funds as high as 65 percent until more engineering is done, are too bloated. The ST3 Overlake-Redmond segment, which he considers the worthiest project, can be delivered without raising taxes, he argued at a Bellevue debate. Fiscal threats loom from recessions, warfare, political upheaval or radical changes in technology, but that’s possible in any massive public works. 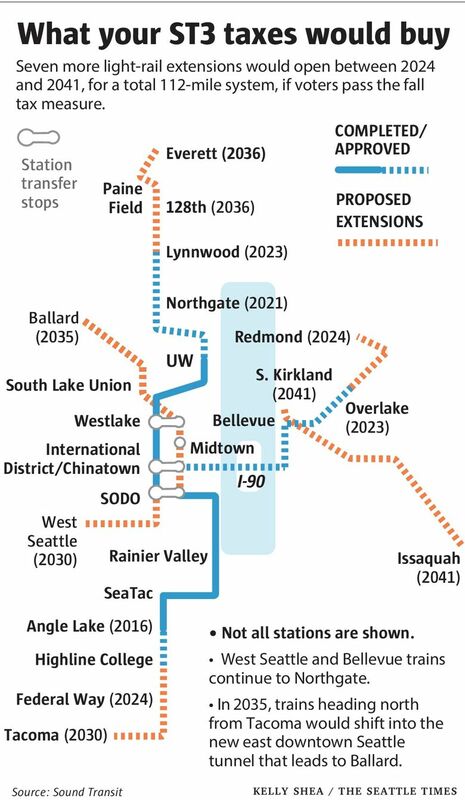 So-called “scope creep,” such as potential tunnels in Ballard and West Seattle, or additional stations in Everett or Issaquah beyond the ST3 budget, might add costs. Can Sound Transit find a windfall? The ST3 plan assumes $4.7 billion in federal grants, a reasonable guess in light of $2.8 billion awarded earlier for the Tukwila, UW and Lynnwood lines. Jonathan Hopkins, spokesman for the group Seattle Subway, said he’s optimistic ST3 can earn a share of presidential candidate Hillary Clinton’s five-year, $275 billion infrastructure plan, while rival Donald Trump also promises to rebuild transportation networks. McCartan’s model includes a blue-sky scenario where ST3 secures $11 billion in low-interest federal loans, bringing cash flow sooner. A similar $300 million loan was awarded to the new Highway 520 bridge, followed by $1.3 billion for Sound Transit’s own Seattle-Bellevue line. Either windfall could help ease the most common objection people raised in ST3 community forums this spring — that they’d like train lines to cities like Everett, Ballard and Tacoma to be completed sooner.